C/ Madrid, 16, 07830 San Jose, Spanje. Hotel Apartments Club Maritim, located in a quiet area in San Antonio bay only 150 meters from the coast and 600 meters from the beach, is the best option to spend a relaxing and pleasant vacation. The hotel has been totally refurbished during the winter season of 2005. In the vicinity of the Hotel you can find a wide variety of restaurants, bars, cafes, as well as many entertainment and sport options. The bus stop to the centre of San Antonio is a few steps to the Hotel. Club Maritim hotel has studios and apartments , fully equipped with sofa bed, bath-room, kitchenette, fridge, microwave oven, satellite TV, telephone, safety-box, air conditioning, ventilator and terrace with garden view. 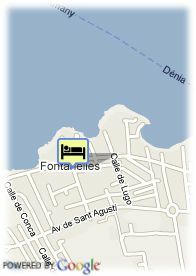 The restaurant is located at Costa Sur hotel, just few meters from the hotel.